Get a move on you, and vote for Taft." Election Day in Los Angeles, and the sweet smell of democracy is thick in the air. Perhaps a little thicker for you if you were a Bunker Hill resident voting in the 30th or 31st Precinct. Though Democrat William Jennings Bryan would sweep the Southeastern U.S., Republican William Howard Taft would win the White House with 51.6% of the popular vote and a commanding 321 electoral college votes. Taft took California in a landslide with 55.5% of the popular vote, compared to Bryan’s 33%. The Socialist voter turnout in California was lighter than had been predicted. Interesting issues on Californians’ ballots included amendments to move the state capital from Sacramento to Berkeley, to limit funds generated by the state school tax to elementary school spending only, and to give state legislators a raise. The Times recommended a "No" vote on all three measures, stating that "many thoughtful citizens, realizing that the present State Constitution is a fearfully patched and inconsistent instrument, have resolved to vote against all further patching, stamping "No" against every amendment." Los Angeles County voted a straight Republican ticket in 1908, placing not a single Democrat in any elected office. Different times. So, enjoy yourselves tomorrow night as the results pour in, but don’t become so engrossed that you fall victim to the sad fate of the politically engaged Mrs. E.S. Kimball. Kimball, a Bunker Hill resident, went down the Hill to the Times Building, where election bulletins were projected on an enormous curtain to an audience of approximately 50,000. In her absence, burglars broke into her house, and stole about $800 worth of diamond and gold jewelry. So, get out the vote – Taft in ’08! From the files of "Where’d that law come from?" we turn to Section 11352.1b of the California Health and Safety Code, which makes it illegal to sell "any material represented as, or presented in lieu of, any dangerous drug or dangerous device." The story behind the legislation takes us to a Chinatown street in the early 1950s where two undercover police from the narcotics division were attempting to score marijuana, and arranged a "hand-to-hand go" of $300 for 5 pounds of "manicured tea." They had their street lingo down, but I’m sure you can see where this is going. The dealer took their money, and proceeded to hand over exactly what he’d promised — 5 pounds of tea. At those prices, let’s hope he at least sprung for Twinings. Once the crime lab revealed their folly, the two officers rushed back to Chinatown to arrest the enterprising young dealer until realizing that they didn’t know what to arrest him for. Finally, they settled on the somewhat dubious charge of grand theft. At first, there was some concern that undercover police officers would have to make their buys using specific, literal language, tipping off any half-wise dealer to their ruse. An apoplectic police force lobbied the California legislature for provisions that would prevent this kind of misunderstanding in the future, and in 1953, they got their wish. One of the first people to stand trial under the new law was a resident of our very own Bunker Hill, Conrado M. Fragoso, a bellhop at 244 South Figueroa. Fragoso arranged to sell $10 of a substance he referred to only as "junk" or "stuff" to Officer Manuel Gutierrez. The "junk" in question was nothing but headache powder twisted into small paper bindles. As the arrest took place on April 1, 1954, Fragoso missed his opportunity to declare the whole thing an April Fool, and was arrested. At his trial, the public defender argued that Fragoso had never claimed to be selling heroin, as he never uttered the word; however, the judge was unmoved. 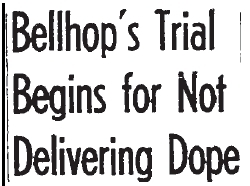 In 1954, a conviction for selling a substance under the pretense that it was a narcotic substance carried a sentence of up to one year in the County Jail. James Saul Pauge, a 60-year-old newspaper vendor and retired railroad conductor, was murdered in his apartment today under exceptionally puzzling circumstances. Help couldn’t have arrived any sooner, but it was still too late. Pauge’s neighbor Louis Jaralillo, a former boxer, heard a shot fired and ran upstairs to Pauge’s apartment to investigate. Pauge stood in front of his open front door, swaying and gesturing towards his back, unable to speak. Almost immediately, he fell over dead of a gunshot wound. The can of soup Pauge was preparing for his dinner was still simmering on the stove. The window in Pauge’s apartment overlooked 2nd Street, and had been left open. Police suspected that a sniper had fired in through the window, and hit Pauge in the back as he stood at the stove. No motive could be established for the killing, and no suspects were apprehended. Police came to the apartment of William Fisher and Walter J. O’Connell, responding to neighbors’ complaints of a loud party. When they arrived, they found seven men and a woman seated primly around a large round table, and grinning like mad. However, police could not help but notice "the odor of synthetic gin was in the air." At first, police were stumped. There was no evidence of a party, and no bottles to be seen. But then, one of the detectives noticed a stream of liquid trickling out from the thick center leg of the table, and a sniff revealed it to be contraband booze. 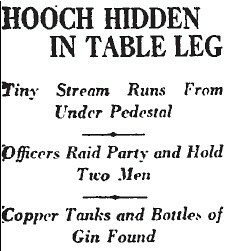 Quickly, the detectives dismantled the table and discovered that its leg had been hollowed out, and a hooch tank and spigot installed. In all the excitement, some careless partygoer had neglected to twist the spigot shut, leading to the telltale leak. 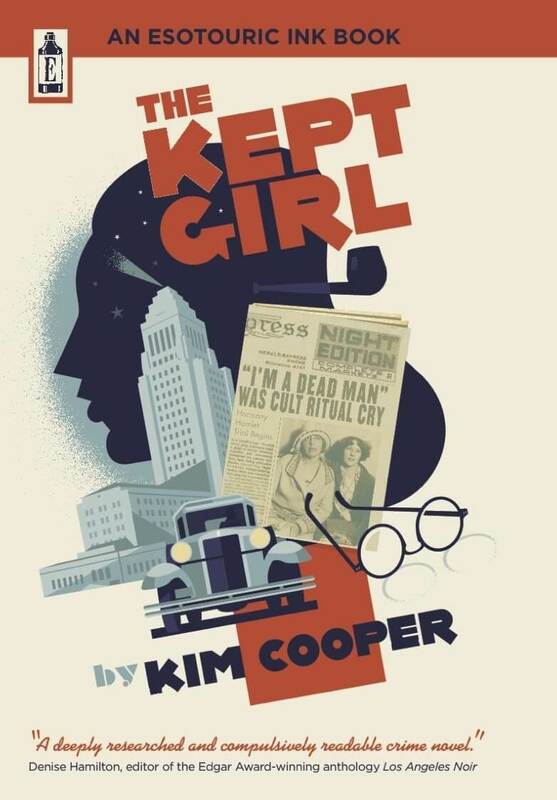 A more thorough search of the apartment turned up two copper tanks, designed to be fitted into an automobile gas tank and used for the illicit transport of bathtub gin. Fisher and O’Connell were booked on charges of violating the Volstead Act. More than anything, 5-year-old Ronnie Bell wanted to be a police officer when he grew up. Six weeks ago, he and his mother moved to 111 S. Figueroa, right next door to the local traffic division, and Ronnie was overjoyed. He started hanging around the station, and got to know the officers, who adopted him as a mascot of sorts. He also followed them out on the streets, mimicking their lingo and actions. Rather than being annoyed, the officers were so impressed with little Ronnie that they gave him a hat and a whistle, and put him to work. Today, Ronnie directed traffic at 2nd and Figueroa, and Sgt. C.W. Nanney declared that his performance would be a credit to any veteran traffic cop. However, Ronnie proved surprisingly easy to lure from his post. When his mother appeared at the corner with an ice cream bar for her son, the hard-working lad went AWOL.